Juanita Mitchell - STEER FOR STUDENT ATHLETES INC.
Juanita Mitchell was born in Mamaroneck NY where she flourished as a student athlete. She is the daughter of Lauringle and Runett Mitchell who moved to the village over thirty years ago. Juanita followed in her brother’s footsteps and began participating in sports at a very young age. Being a part of a team allowed Juanita to develop the determination, perseverance and a work ethic that has helped her be the successful person she is today. 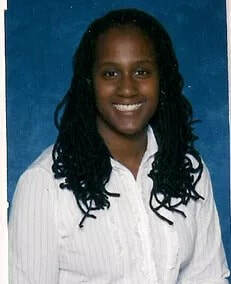 Juanita attended Mamaroneck High school year, where she had a successful academic and athletic career. During her years of attendance, as a athlete, she was selected as an All section, All county and all league player for many seasons in volleyball and only 1 year in softball. After 2 years of playing softball at the junior varsity and varsity level she decided to pursue a more serious career in volleyball. With her parents support, and guidance from Dr. Nora Mazzone and Suzanne Elson, she was given the opportunity to be a member various travel volleyball programs. This is where she developed her skills which led to her to receiving an athletic scholarship to attend Virginia Commonwealth University (VCU). As a freshman and sophomore, Juanita was a starter for the VCU volleyball team. Here is where she had to learn to adapt to change and be flexible when comes to supporting the team. She specifically experienced this after there was a change in coaching staff. During her junior and senior year Juanita Mitchell was no longer considered a member of the VCU volleyball program and decided to pursue a career in community service for the metro area of the city of Richmond while finishing up her Bachelor’s degree in Psychology. During her junior year, Juanita participated in the America Reads program while attending school full time. She was able to participate in a national program that was initiated by former President Bill Clinton to “ensure that every child can read independently by third grade.” The following year she decided to increase her service to the community by participating in the VCU AmeriCorps program. She was able to complete a one year commitment of community service to children of the Richmond in 10 months. During her participation in AmeriCorps she continued to support the needs of improvement in elementary students’ literacy skills, while also addressing other issues in the community. After graduating from VCU, Juanita returned to New York and began pursuing a master’s degree at Manhattanville College while participating in the accelerated master degree program, Jump Start program. While completing her masters in eighteen months, compared to the traditional 24 months, she started her first of teaching in an elementary school in the Bronx. Once she graduated she took a year off before deciding to pursue another master’s degree in TESOL (Teaching English to Speakers of Other Languages) at Lehman College. This decision was solely based on the fact that due to the language barrier she felt she couldn’t support her students the way she wanted to. She felt the need to figure out what was the best way to help English Language Learners receive the education they deserve. Once she graduated she decided leave the New York City Board of education to teach abroad in Mexico where she experienced the hardships of being a language learner. After a year she returned to New York in hopes of returning to the first school that gave her the opportunity to teach. Things didn’t work out as she planned, but in the end she did get another teaching position in the New York City Board of Education.Last year was the end of her career in the New York City Board of Education and this year is her first year teaching in the Port Chester School District as a sixth grade teacher in the middle school. While pursuing her professional career, Juanita never left the volleyball court. Her coaching career started as soon as she moved back to New York. She started coaching at the modified level at the Ursuline School in New Rochelle. Last year she had the privilege to coach at the varsity level in her hometown of Mamaroneck.